* Bus-powered, requires no external power. * Supports RS-232 serial data transfer rate from 75bps to 12Mbps 256byte inbound and outbound buffers. * Dimension: 2.13"(L) x 0.6"(W) x 15"(H) pigtail cable: 24"
* Windows 7/8/8.1/Server2008R2/2012/2012R2/10 automatically detect and install driver without disk. 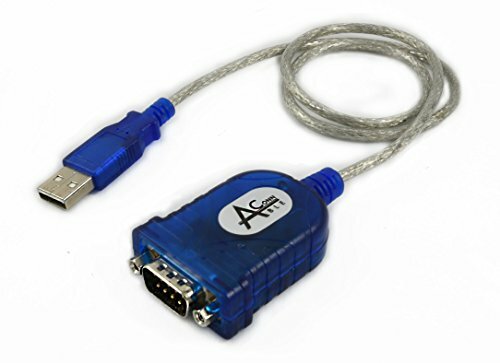 Easily add a RS-232 DB9 serial port to your PC when it requires RS-232 serial communication with other devices. Built with Prolific PL2303HX Rev. D chipset which has been widely used and is fully compatible in most operating systems such as Windows, Mac, and Linux, etc. Supports RS-232 serial data transfer rate from 75bps to 12Mbps 256byte inbound and outbound buffers. Full duplex transmitter and receiver. Six modem control RTS, CTS, DTR, DSR, DCD, and RI signals. Supports remote wake-up from MODEM input signals. Plug and play with the creation of COM port which simulates the traditional COM port on most operating systems allowing the existing COM based applications migrate to USB serial. CE, FCC certificated. USB bus powered, no external power required. Low power consumption.